You're probably used to Norwegian Airlines making headlines -- perhaps on this very site -- for its truly great sales on international flights. However, lately it's caught the attention of many for a slightly less innocuous reason. 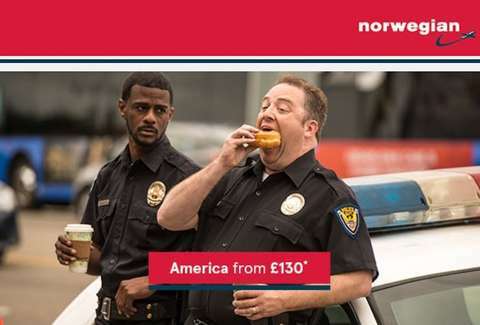 That's because the budget carrier's getting heat for running an ad campaign hyping its super-cheap flights to the U.S. using a photo of a rotund police officer chomping down on a donut. The cheeky ad in question, which was spotted online by several people outside the States, was used to promote a sale on one-way flights to America "from £130" (about $175). The marketing copy is overlaid on a pic of two police offers leaning against their squad car, one who's literally opening wide to stuff a donut in his mouth beside the other who's looking over at him in what can only be described as disgust. Needless to say, the rather, uh, creative choice has people buzzing on social media. Many thought it was either hilarious, on point, or both. Yes, @Fly_Norwegian - your ad is offensive! And it got some people thinking. But no matter how you feel about it, it's tough to argue that the ad wasn't effective. After all, you're reading about it right now, aren't you?